Apartment In the grounds of our secluded villa with private pool. The secluded garden with several palm trees, and olive trees is very private, ideal for sunbathing in complete privacy. There are lawned areas ideal for boules, volleyball etc, and there is a wooden games box, full of garden games. We have a gas barbecue and a charcoal one, situated on a side terrace by the pool, which is 8 x 4m. 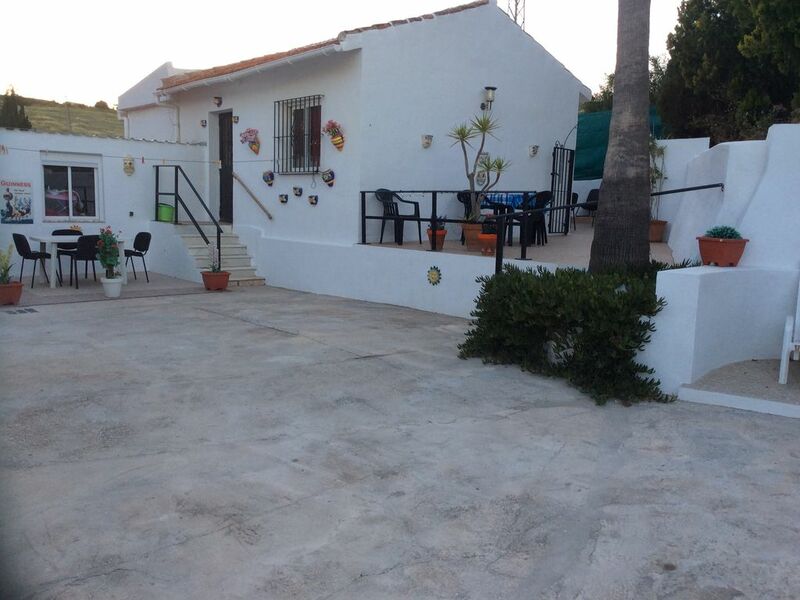 The 2 bed flat which is the one for rental has patio doors leading onto a private, gated and secluded patio, which has sun loungers, mats and table and chairs. There are also tables/chairs and loungers on the side and front patios of the flat and in various other locations round the gardens. The pool is completely private and is used by our guests and us solely, although we rarely use when guests are here. Outside the main villa where we live, on the side is a lovely seating area, to relax or eat meals cooked on either of the bbqs. The main terrace at the front of the our villa, overlooking the pool, there are eating and relaxing areas, with music and games and Xbox when we are home. Please note that all quotes expire after 14 days. A new enquiry can be made if the dates are still available. We chose this property in 2000, because of its ideal location for everything. It is within 25 mins walking distance from the village, where you have access to good train and bus services, should you prefer not to drive. The village has all the necessary facilities of banks restaurants and shops and a lively Sunday market. For people who have not visited inland villages, you will find drinking and eating out is very cheap. Menu del dia, a 3 course lunch is approx 7e in most places and the village Chinese does a 3 course meal, Tuesday to Friday including a drink, currently at a price of 6.95 e. Of course most bars are famous for their selection of tapas and fish. A quiet break in a secluded area, where guests can relax on their own or join in with any of the games we have. Complete privacy was a must when we purchased the property. The bathroom has a walk in shower, and the usual amenities. Paid for on daily usage. Located in the garage area, available on request. The living room has a TV, CD, and DVD. Selection of these, plus books and games for guests use. Air-conditioning unit, which is an optional extra at the cost of electricity used, is located here. The kitchen which overlooks open fields, has a full oven, microwave, fridge freezer, toaster and kettle. Many DVDs available, located in the main villa, for guests to use. Small library of books in the bungalow, and a large selection available in the main villa. CDs available on the main terrace patio. Sierra Navada is within easy reach. Local Tennis courts in Cartama Estacion. Alhaurin Golf, Mijas Golf and Laura Golf Clubs are all within a 10k radius. Had a great week in the flat and Carol and Richard were very helpful. Flat had everything we needed - forgot there were two bedrooms so we had a wardrobe each which was useful. Wi-Fi was very hit and miss but managed to get it in front of Carol and Richard's house. We enjoy walking into town for evening meals which in this case was not possible as it would have been a thirty minute walk (the first part was an unlit lane with dogs at most properties) although Carol and Richard do offer a taxi service. Carol and Richard's three little dogs and two cats are brilliant. Just a warning weather wise - we had a lot of rain the night before we left which resulted in road closures and what should have been a half hour journey to the airport taking an hour and a half. Great week and would go again. Thanks Carol and Richard. Thank you for the lovely review, please if you do come back here, let us know either in the morning, or the night before and we will drive you down and back for nothing Ok.
Beautiful area and fab hosts! I stayed for a week in Sept, my first holiday alone with my two children 3.5 and nearly 2.. I got car hire which is a must. Carol and Richard met me at a bar in the town, where they bought us drinks and chatted for a while before showing me the way to the villa. The accommodation is small but adequate and has plenty of out door space.. When your on holiday you don't spend much time inside so this didn't phase me. The pool area is lovely and you are free to use this whenever, we had it too ourselves morning or afternoon when we weren't at the beach.. It was clean but yes their are flies wasps overnight so there is a net to use, which again you expect.. I also had ants in there the first night but was given a spray to use and a vacumn. As long as you clean up after Making food or eating there was no issue for the rest of our stay. Carol and Richard are amazing hosts and nothing was too much for them, they did us a bbq, watched my two little ones from time to time, gave advise on where to go, we're very sociable in the evenings, and lent me mozi treatment, and even socks. They really couldn't have done more. My children loved the 3 gorgeous dogs and still ask after them (Toby is their fav) and still talk of Carol and Richard too bless..
Thankyou for such a very favourable comment. You and you family were absolutely brilliant, and it was a privilege to have you all stay. In fact for a few hours after you left, the dogs were looking round for their play mates. Hoping you return to us another year. Spent 8 nights and had a wonderful time, Richard and Carol were very friendly and helpful, really good for recommendations on what to do. Have to say that their 3 dogs were one of the highlights, friendly laid back and extremely sweet, living their best lives! Really pleased you all enjoyed your time with us and the fluffs, it was lovely having you all here. One night was more than enough!!!!! On arrival at the property we found the property owners to be very hospitable. First impressions were how very small the property was extremely cramped for the 5 people it slept, the details on this website are misleading to say the least. The Property needed a good clean surfaces and floors were sticky, tiles broken, generally grubby. Ants in the kitchen probably not helped by leftover food in cupboards from previously guests, and ants in in the bathroom. Bathroom was horrendous a bi-fold door leading directly into the kitchen that wouldn’t close. Following 3 of us having showers, water took a long time to drain leaving a raw sewage smell behind, only worsening as the evening progressed. I could go on and on listing the issues, but feel that having to fork out for alternative accommodation says it all. We had booked the apartment for a week but after spending one night, in the heat, air conditioning was inadequate and only in living room. With a combination of heat and raw sewage making sleep near impossible my husband ending up sleeping in the hire car. After our first night we left the apartment early the following morning and decided we couldn’t stay another day in those conditions and made the decision to find alternative accommodation, which we did and returned later that day to collect our belongings and advise the owners of our reason for leaving. After we left we contacted the owners via email asked for reimbursement in view of the fact we had only stayed one night - they dismissed our complaints. We contacted them again asking for compensation they refused simply pointing us to their terms and conditions something which was never offered or received. An official complaint was lodged with HomeAway but at the time of writing no response has been received. When looking for holiday properties we always read reviews, it’s great to hear what other guests have to say about a property and helps when trying to decide where to stay. Normally we don’t leave reviews but feel that for this particular property it is important that future guests are aware of what they are getting, we can’t understand why the previous reviews are so good, it truly doesn’t deserve it. Thank you Carol and Richard for all your help and support during our stay . Nothing was too much trouble. We will be back . P.S. the torch has come in very useful!! We stayed a week at Carol and Richard's place on May 2017. There were 3 of us and had lovely time and plenty of space. Our daughter loved the dogs and swimming pool. We had BBQ almost every evening and afterwards explored the area by walking around the small roads. This was our first vacation in Spain and we're happy to choose this place for staying. Carol and Richard helped us with our every wish. Must thank Richard as he helped when my "stores" ran low :). Thank You. Thankyou very much for your honest comments it was a pleasure having you and you family here. Just a quick mention of the Feria Dates this year for those who enjoy visiting one on their visit with us. Cadiz Anual Carnival is held in February. World International fair 29th April to 3rd May held in Fuengirola. We are located approximately 20 minutes by car from the Costa del Sol coastal resorts of Benalmadena, Torremolinos etc. 1 hour from Granada, and other inland towns and the lakes are within an easy drive. Location is 15-20 minutes drive from Malaga Airport and 20 minutes from Torremolinos, then Benalmadena, Fuengirola etc. Car hire is advisable, but for guests who prefer not to drive, we can offer a taxi service, to the village or beyond, prices are shown in the bungalow information file. In the village you can travel by bus or rail, into Malaga and beyond along the coast or inland. We are few minutes drive from Estacion De Cartama, which has lots of banks, shops, bars and restaurants and a lively market on Fridays and Sundays. The village is a flat 30 minutes walk away, and we also have 2 adult road bikes which guests can use to ride down the road to the village (please let us know on booking.) Mercadona, Lidl and Carrefour Express are situated in the village, which means shopping for essentials, is even easier. So you can get back here to really relax in the garden.